Defensive strategies may be available to you as you face a potential foreclosure. You need to keep two points in mind when you defend yourself against a foreclosure--you need to be proactive and you need to consider all of your options. Your most effective option to stop foreclosure may involve taking action beyond the foreclosure case itself. For example, you can file for bankruptcy. Additionally, you can stop a foreclosure with a predatory lending lawsuit in some cases. Obtain a standard petition form from the court clerk. 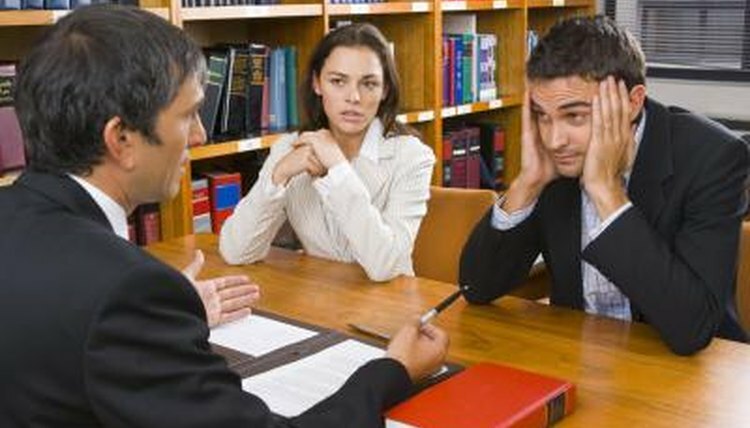 The court clerk maintains a variety of forms used in civil lawsuits, including a petition, which is the document used to start a case. List yourself as the plaintiff on the petition and your home mortgage lender as the defendant. Complete the petition, setting forth the facts pertaining to why you believe your mortgage lender engaged in predatory lending practices. Examples of predatory lending practices include steering potential borrowers to subprime (higher interest) loans when they qualify for traditional lower interest options as well as deception about interest rates, hidden charges and fees, according to "Illegal Predatory Lending: A Self-Help Guide" by Debra Saunders-Sparks. Prepare a motion requesting that the court issue a temporary restraining order preventing the home mortgage lender from taking possession of your home. One court cannot bring a foreclosure action filed in another court to an end. However, the court in which you file a predatory lending lawsuit can enjoin the lender that seeks to foreclose on your property from taking possession and evicting you from the premises. File the petition and motion with the court clerk. Request the court clerk to arrange to have the sheriff serve the petition and motion on the "agent for service of process" of the mortgage lender that is seeking to foreclose. You can obtain the name and address of the agent for service of process for a business like a mortgage lender from the secretary of state's office. Ask the clerk to send your motion for temporary restraining order immediately to the judge assigned to your case. The judge needs to review and act on that motion as soon as possible to ensure that a temporary restraining order is issued to protect your interests. Broemmel, Mike. "How to Stop Foreclosure with a Predatory Lending Lawsuit." , https://legalbeagle.com/5868092-stop-foreclosure-predatory-lending-lawsuit.html. Accessed 22 April 2019.